The James Bond franchise — with all of its womanizing and improbable escapes — has never held much appeal for me. 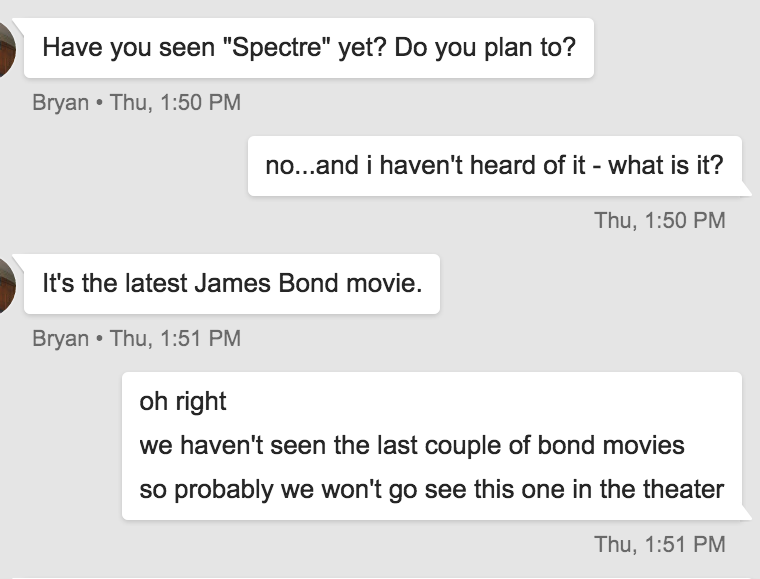 So when my dad asked me if had seen the latest movie last week, it should surprise no one that I responded with the text equivalent of a blank stare. Now I was really intrigued. Was it possible that some of the minute details to which I’d devoted my grad years had rubbed off on one of my closest relatives, to the point that he would notice the difference between a volcano and an impact crater in a James Bond film? After a bit of quick googling, I had my answer: YES! 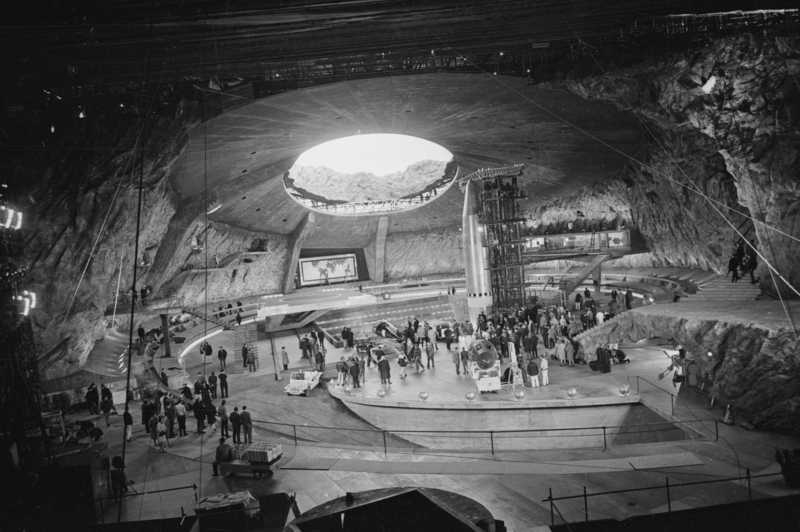 SPECTRE‘s “meteorite crater” (lair of the evil villain Blofeld, né Oberhauser) was actually filmed in an extinct volcano outside the Moroccan city of Erfoud named Gara Medouar.1 Not having seen the movie itself, I did find a behind-the-scenes look at a massive (and apparently record-breaking) explosion filmed for the movie that gives us a good look at the outside of the ancient caldera. Even with just that brief glimpse, we can already say a lot about this crater.2 An impactor striking the surface at planetary speeds (several to tens of kilometers per second) carries a huge amount of kinetic energy, all of which suddenly has to go somewhere. The resulting explosion almost always creates a circular depression (regardless of the original impact angle) with a raised rim and ejecta blanket that thins out the further away you get. 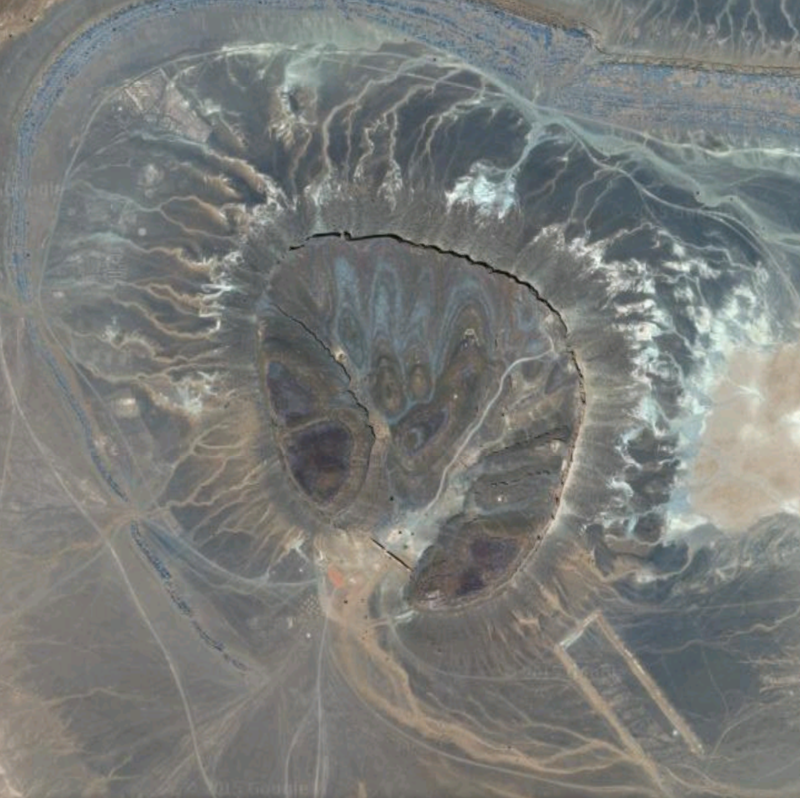 The dimensions of the crater — its diameter, the depth to the floor, the height of the rim — are not random, but closely related to each other and the total energy of the impact. If you spend enough time looking at examples of lunar and terrestrial impact craters, you get a sense for the ones that look “wrong,” and this one just doesn’t look right. Ninety-nine times in one hundred the bottom of the lunar crater lies lower than the outer plain; ninety-nine times in a hundred the bottom of the Vesuvian crater lies higher than the outer plain. Ordinarily the inner height of the lunar crater rim is more than double its outer height; ordinarily the outer height of the Vesuvian crater rim is more than double its inner height. 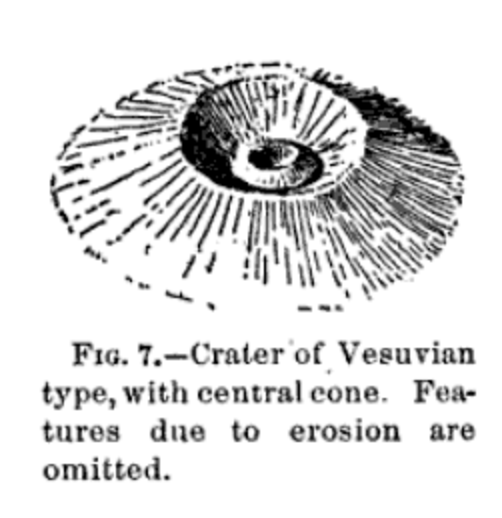 The lunar crater is sunk in the lunar plain; the Vesuvian is perched on a mountain top…Thus, through the expression of every feature the lunar crater emphatically denies kinship with the ordinary volcanoes of the earth. Oberhauser: Do you know what it is? Madeleine Swann: It’s a meteorite. Oberhauser: Yes, exactly. The Kartenhoff, the oldest in human possession. 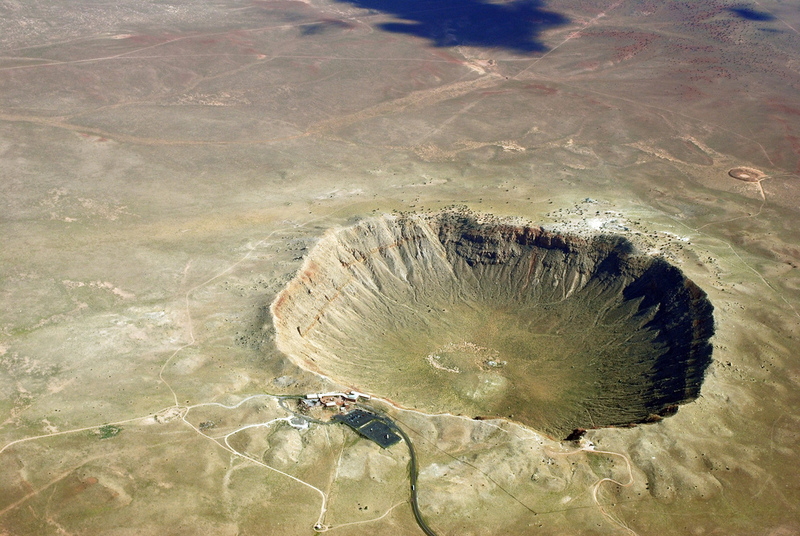 The very meteorite which made this crater. Think about it: so many years up there – alone, silent – building momentum until it chose to make its mark on Earth… a huge unstoppable force. James Bond: Except it did stop, didn’t it? Right here. 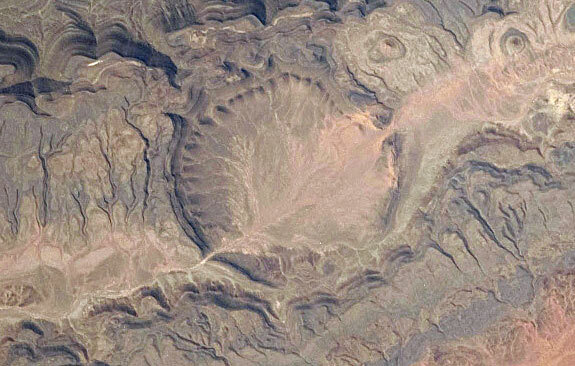 Ok, so we’re meant to believe that the “meteorite which made this crater” (more on that later) is also the oldest meteorite in human possession…really? 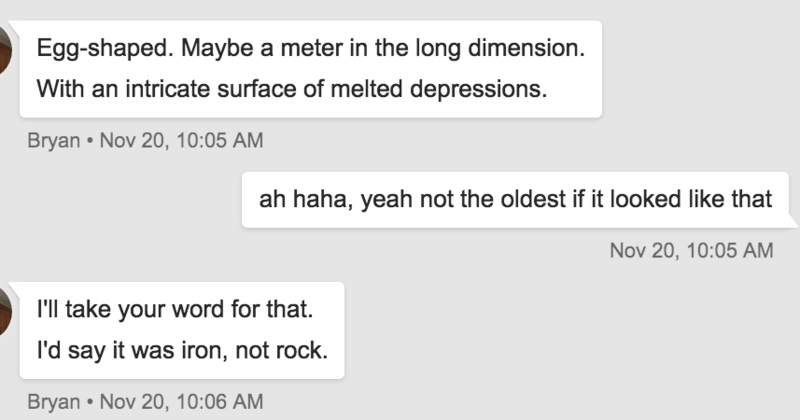 Not having actually seen the movie, I asked my dad what the meteorite in the scene looked like. 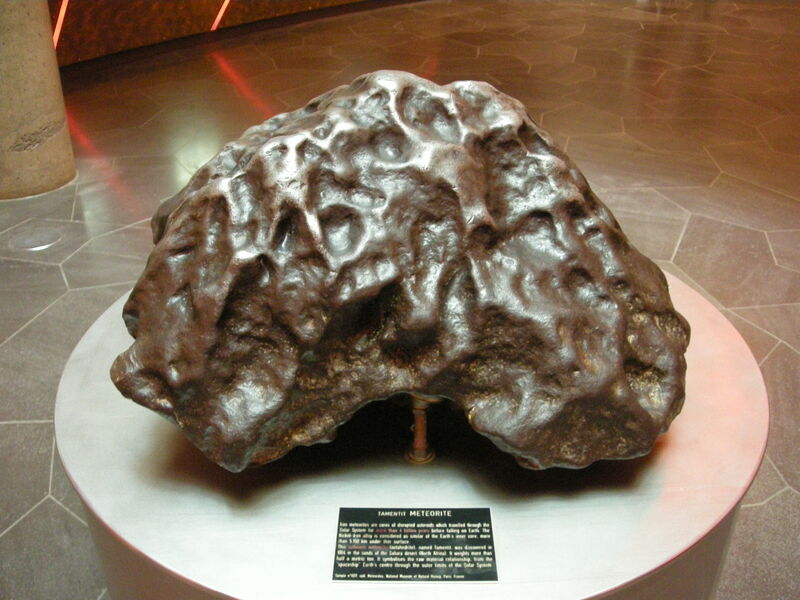 Iron meteorites, like this one, are pretty alien looking. Iron meteorites are thought to be the cores of once-mighty proto-planets that have broken apart in some violent collision and eventually made their way across the solar system to land on Earth. By definition, they have melted and recrystallized — they’re not the oldest meteorites! That title goes to the least altered, most primitive samples we can find, the carbonaceous chondrites. 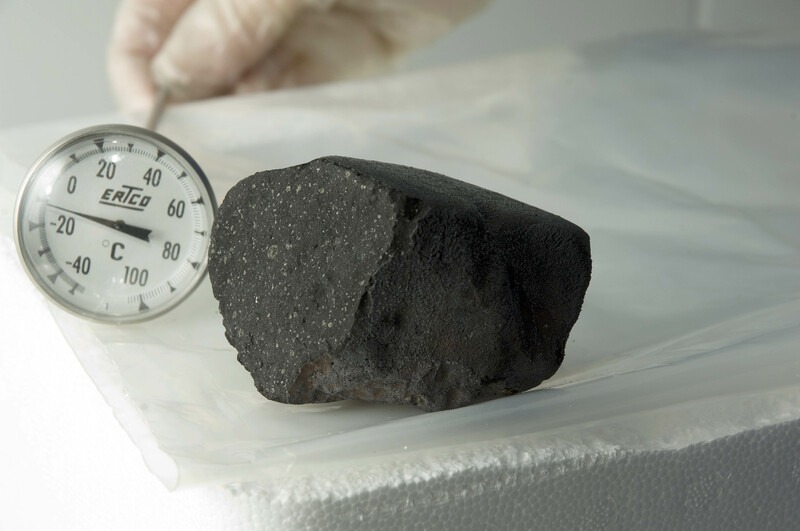 Visually, they are less stunning, perhaps not even immediately recognizable as meteorites, but inside they contain the birth records of the solar system. Analyzing these meteorites is the best way we have of understanding the original composition of the pre-solar nebula,8 out of which the Sun and the planets and ultimately you and I formed. We are made of star stuff, yes, but what star stuff? Carbonaceous chondrites tell us that. 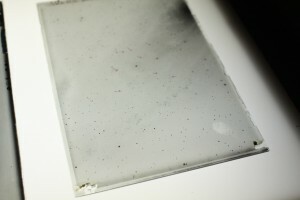 Some of them, like the Tagish Lake meteorite, even contain unchanged stellar dust particles, grains that predate the Sun. Now that’s OLD. Tagish Lake meteorite, possibly the oldest meteorite in human possession, looks like a boring Earth rock. But what if Oberhauser meant “this meteorite is from the oldest-known impact“? That assertion doesn’t make sense either. The oldest identified impact structures on Earth don’t really look like craters anymore, thanks to our planet’s tendency to rough up its landmasses via plate tectonics. 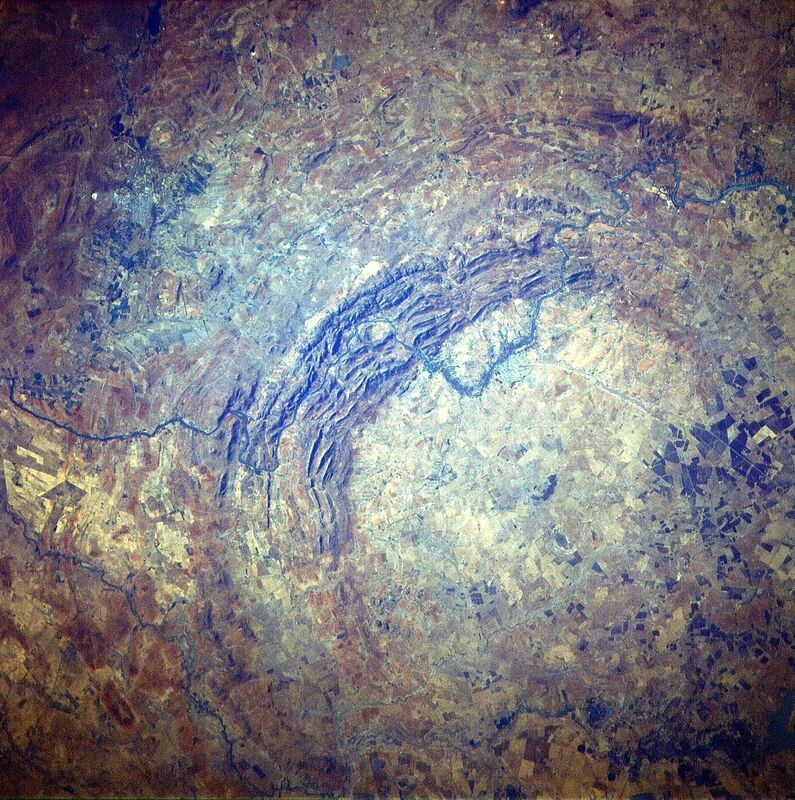 One candidate for the oldest terrestrial impact structure is Vredefort crater in South Africa. Only the central dome survives, the rest of the crater having been eroded and filled in over the two billion years since its formation. Compared to the relatively pristine Barringer Meteorite Crater (Meteor Crater) in Arizona — a sprightly 50,000 years of age — Vredefort is hard to spot. It takes geological evidence in the form of impact-generated mineral phases, glass spherules, and shattercones to identify the oldest craters. It’s not the oldest meteorite, and it’s not the oldest crater. Either Oberhauser has been badly misled when it comes to his collection, or the writers really didn’t care very much about getting the science right in this case. Does it really matter? Perhaps not, but it’s certainly a missed opportunity. With just a little bit more research, they could have turned real science facts into support for their story. It wouldn’t even have been that hard. Oberhauser seems to be talking about himself in this scene, using the meteorite as a convenient vehicle to talk about his own journey and motivations. Call me crazy, but incorporating some dialogue about refining a central iron core that’s ultimately flung onto a crash course with humankind by a violent event deep in the past doesn’t sound completely out of line with the Bond villain archetype. 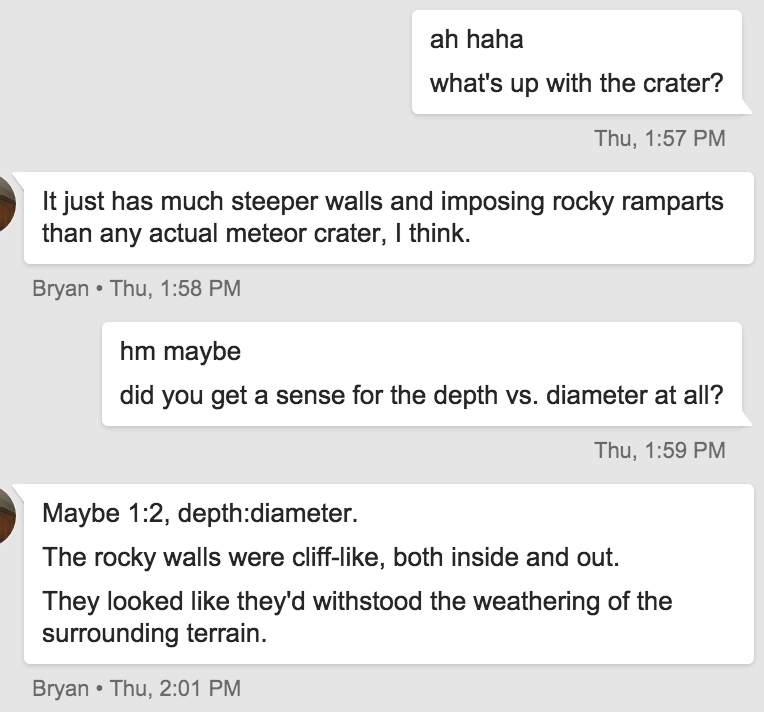 It’s a far more fitting metaphor than “the very meteorite which made this crater,” seeing as the parts of the (much bigger) impactor that actually made the crater wouldn’t be around any more to provide a backdrop for this conversation.9 The meteorite is the part that survived — the resourceful, resilient fragment of a much larger entity. Given a chance, the science here really could have augmented the story, but SPECTRE passed on that chance, and I can’t help but feel a little disappointed that it did. It’s been a little more than a month since we arrived in Somerville, and it still hasn’t quite sunk in. After living in Pasadena for eight years, it still feels like we might be heading back any day now, as if the last few weeks have just been an extended vacation, and it’s ending now. But we’re here! And so far it’s been pretty wonderful. We’re still not completely unpacked and we miss our California friends to no end and I’m figuring out how to best work from home and not go stir-crazy, but September and October have already been jammed full of reunions with old friends, meeting online friends in person, family visits, and just all-around awesome experiences. I visited the Great Refractor at Harvard and stood under the USS Constitution while it’s in dry dock. I’ve gobbled steamed pork buns and sampled various local craft beers, and yesterday I had my first Union Square Donut (which was amazing)1. At the annual meeting of the NASW2 this past weekend, I got to meet some of my heroes and connect with the local science writing community (there’s some overlap there). And this weekend we’re going to go get lost in a corn maze3 because they have autumn here and that’s a thing that actually happens. I’m so grateful to everyone who has reached out and welcomed us here, and I’m really looking forward to feeling at home in the Cambridge area again. I’ve let this blog lapse a bit over the past few weeks (and months, to be honest), and that may continue for a bit while I get my feet back under me. I’m thinking hard about what I want it to become and how I can best achieve those goals, and I’ll keep you posted on my progress. In the meantime, thanks for all the support! After 8(!) sunny years in Pasadena, CA, we’ve decided to move back to the east coast! 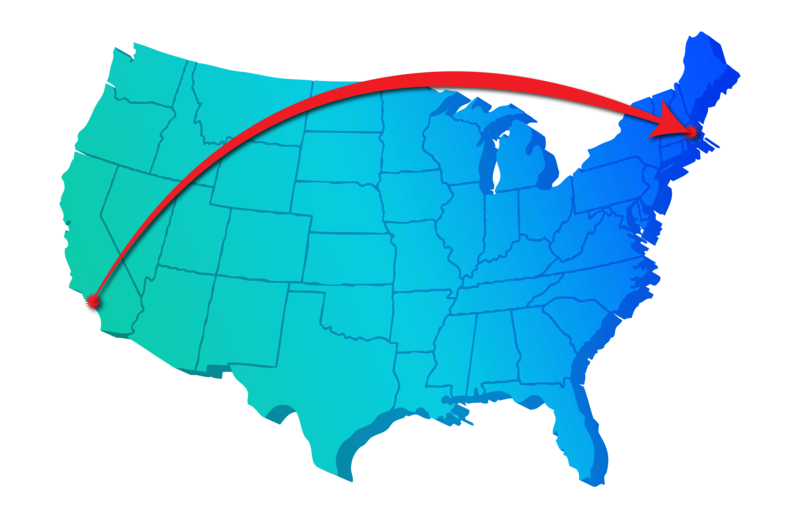 We’ll be making the cross-country trip to Cambridge, MA, in late August. Yes, it will be cold and rainy sometimes, and yes, we’ll deeply miss all of our friends and colleagues in southern California, but we’re also looking forward to this next step! Woohoo! The planet was engulfed in a dust storm and very little could be discerned except for polar caps and some dark spots which turned out to be volcanoes poking up above the dust. As an aside, there was a lot of argument about those volcanoes. They looked exactly like calderas. But already by that time, the perception of Mars as a lunar-like body had solidified, and there was just enormous resistance to interpreting those dark spots as the summits of volcanoes. Man’s first close-up look at Mars has revealed the scientifically startling fact that at least part of its surface is covered with large craters. 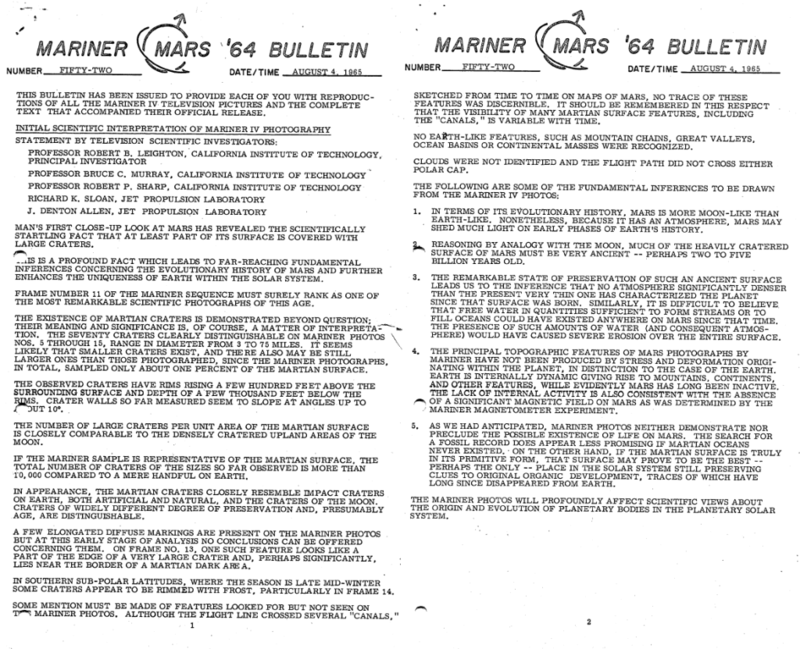 This is a profound fact which leads to far-reaching fundamental inferences concerning the evolutionary history of Mars and further enhances the uniqueness of Earth within the solar system… Some mention must be made of features looked for but not seen on Mariner photos. Although the flight line crossed several “canals,” sketched from time to time on maps of Mars, no trace of these features was discernable. It should be remembered in this respect that the visibility of many Martian surface features, including the “canals,” is variable with time. 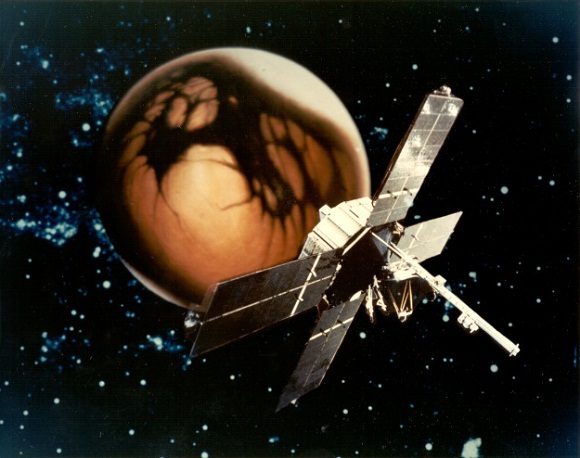 Mariner 4 arrived at Mars to find it cold and barren – “more Moon-like than Earth-like” – and that revelation, as Mike Carr recalled, fueled the dominant perception of Mars for the missions that followed. The Mars of 1965 had to fit somewhere in our limited palette of planetary analogs, and the never-before-seen craters of the ancient highlands tipped the scale toward the lunar end. Ground-based observations of the seasonal cycle on Mars, evidenced by the retreat and expansion of polar caps and changes observed in shade and placement of darker regions, had inspired hopes of a geologically active planet, but the cratered terrains and absence of a magnetic field said otherwise. In fact, they said it so loudly that when Mariner 9 caught a glimpse of Olympus Mons “poking up above the dust,” it took a lot of convincing to entertain the notion that Mars might be more Earth-like than our first encounter suggested. Pluto is red! It looks like Mars! 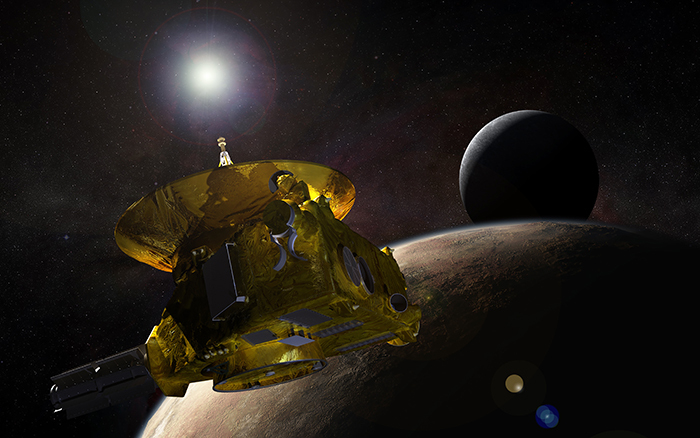 It’s been very exciting to see Pluto come into focus, and even more interesting to watch the process of viewing, describing, and naming features that have gone from light or dark patches to “the whale” or “the heart.” I can’t avoid thinking of this process in the context of previous planetary quests, especially Mars exploration with its history of telescopic observation, flybys, orbiters, and rovers. It’s satisfying to see that Mars has graduated to become an analog for even newer worlds – what an exciting time to be alive! 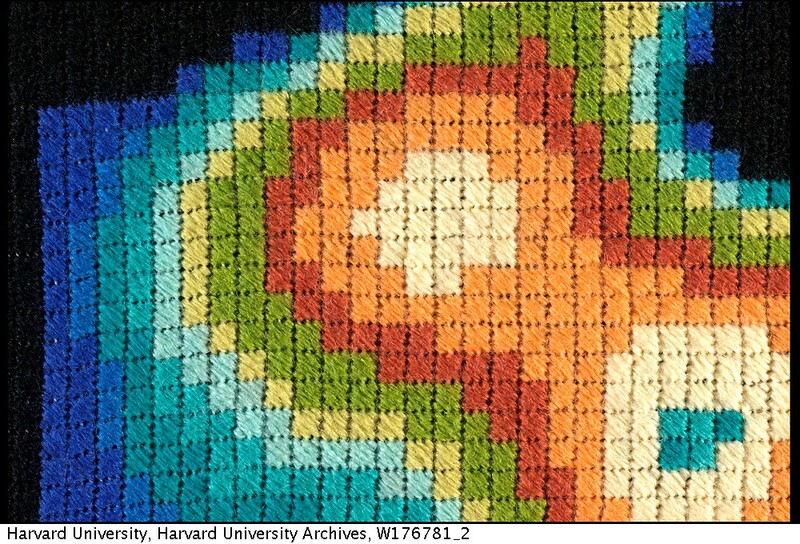 When John R. Whitman saw an X-ray image of the Cassiopeia-A supernova in Scientific American in 1975, he decided it would make a lovely needlepoint design, and when he wondered who he might ask to produce it, he immediately thought of his good friend, Dr. Cecilia Payne-Gaposchkin. 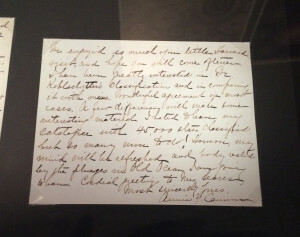 In a brief article for PieceWork Magazine in 2004, Whitman described how his friend Philip Charles, a co-author of the Scientific American paper, sent him the data file for the Cas-A X-ray image. 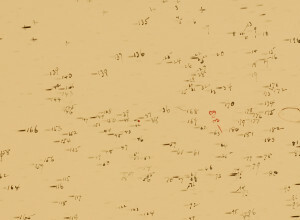 He printed the schematic using a computer at the Smithsonian Institution’s Center for Short-Lived Phenomena, where he worked at the time. This past Saturday, I co-ran a”Genius Day” workshop for a dozen or so middle school-age kids for a local non-profit organization, the Institute for Educational Advancement. Previous “Genius Days” have focused on Darwin, Shakespeare, and William Strata Smith, and I helped out a friend last summer with some Galileo-themed activities. At first, I was little skeptical of the focus on Genius and Geniuses, because there’s so much baggage around figures in the history of science bearing that title, and because (IMHO) kids – especially ones who are constantly told they are “gifted” – don’t need added pressure to live up to an impossible ideal. So I was initially a bit worried about what I would encounter at a “Genius Day” centered on Galileo. What I did find, however, was a focus on interrogating the idea of “genius.” Impressions of the word were collected at the beginning of the day and re-examined at the end, after a series of activities and discussions and slide presentations. It was well done! When the opportunity arose (several months later) to run one of these workshops myself, we decided to focus on Annie Jump Cannon – the first woman in the series. There are a lot of threads to Cannon’s story, and that complicates the notion of “genius” in a good, thought-provoking way. She’s a woman who worked primarily in a man’s world. 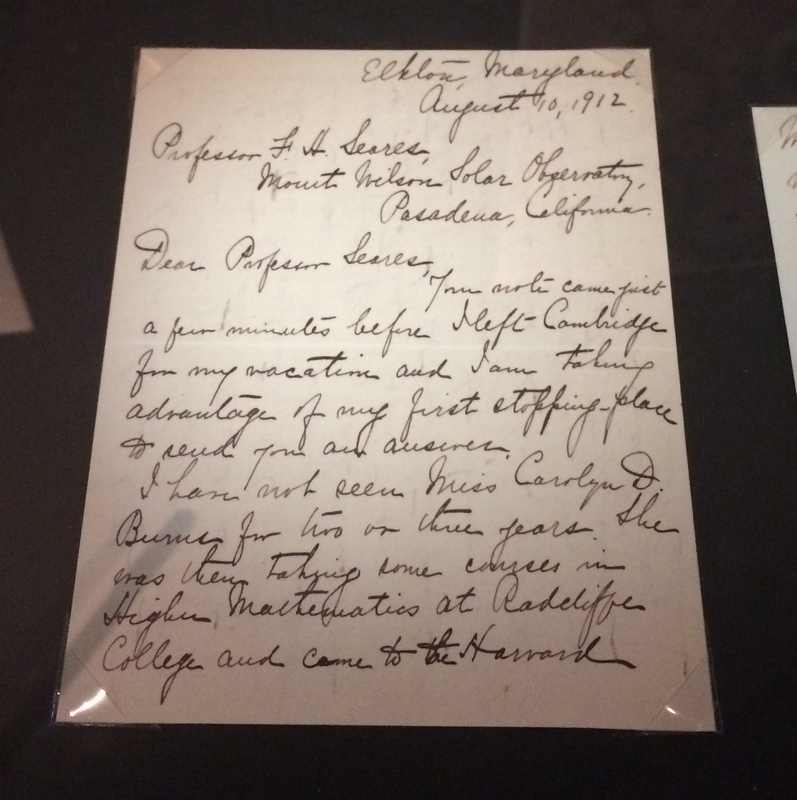 Whether her employer, E. C. Pickering, was progressive or just penny-pinching for hiring women to work as researchers is a question that has no straightforward answer. She also lost most of her hearing to scarlet fever in early adulthood. 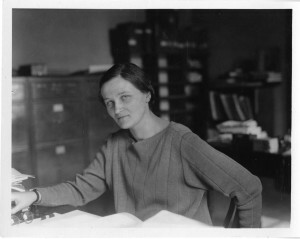 Her impressive work – developing a stellar classification system and classifying hundreds of thousands of stars – was the product of decades of hard work, and understanding her achievement requires knowledge of photography (including photographic plates), prisms, spectra, and absorption lines. Having navigated all of this over five hours this past weekend, I thought it would be useful to share some of the materials that we – myself, along with Louise Hindle and Min-Ling Li at IEA – gathered and created for the workshop. After an introductory discussion about the word “genius” and everything it might mean, we launched into a discussion of photography. I wanted to get the kids thinking about how photographs are and are not objective representations of reality. 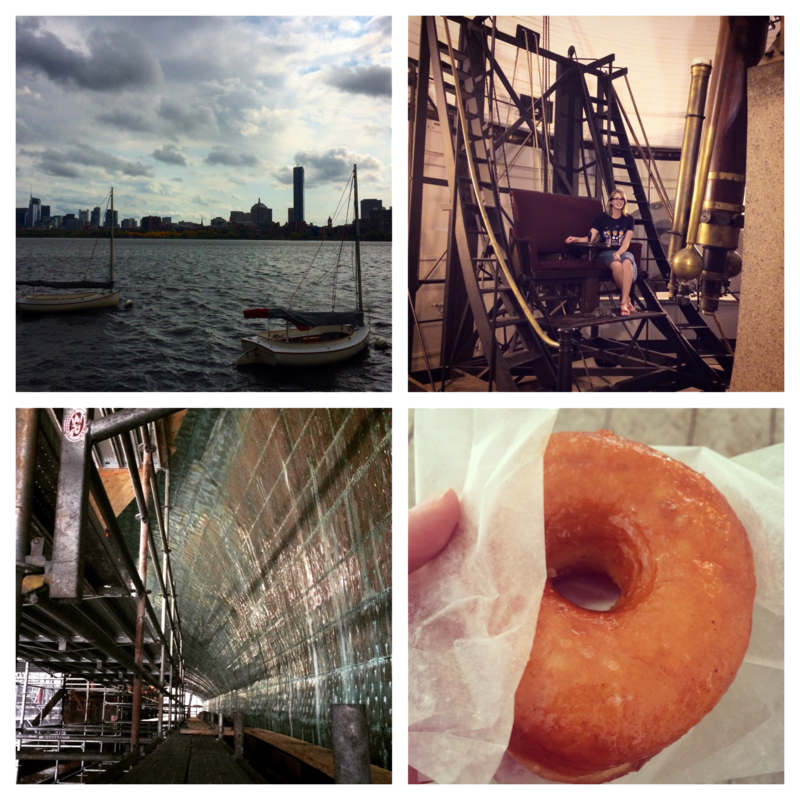 We talked a lot about how the choices they make in taking photos – even digital ones with their smartphones – influence the final product, and we connected this idea of “making” a photo (rather than “taking” one) to older forms of photography. Then we really had a treat! 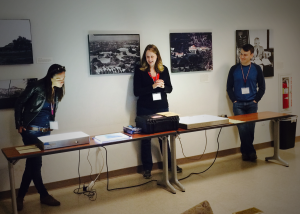 Representatives from the Carnegie Observatories Cindy Hunt, Andrew Benson, and Catharine Vlahakis brought over several real photographic plates from the Mt. Wilson Observatory archives to look at. From the surface of the Moon, to spiral galaxies, to nebulae, there was plenty to marvel over, and having the physical objects there really drove home the materiality of the photographic medium. 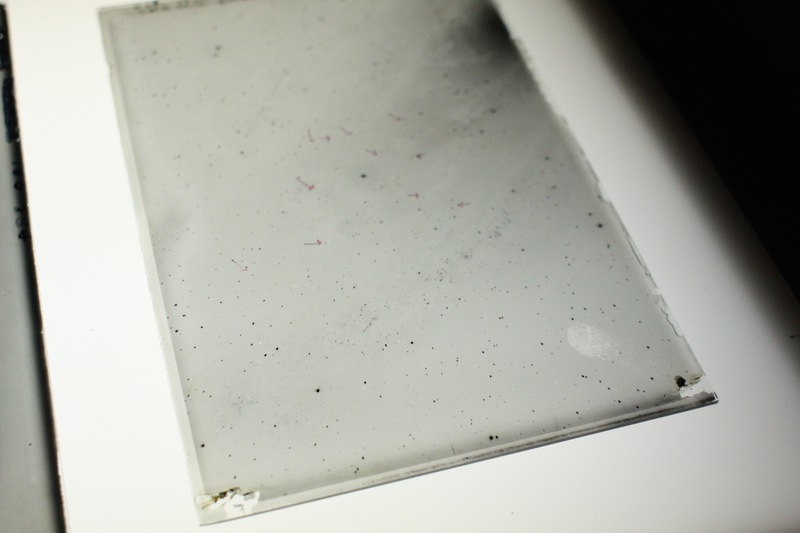 They even brought a plate from Edwin Hubble’s search for variable stars in the Andromeda Galaxy, complete with his fingerprint baked right into the photographic emulsion – talk about tangibility! Many of the participants took photos of the plates with their phones and had fun reversing the negatives to see what they would look like to the eye, and I think some of those points about the manipulability of photographs really landed with them. 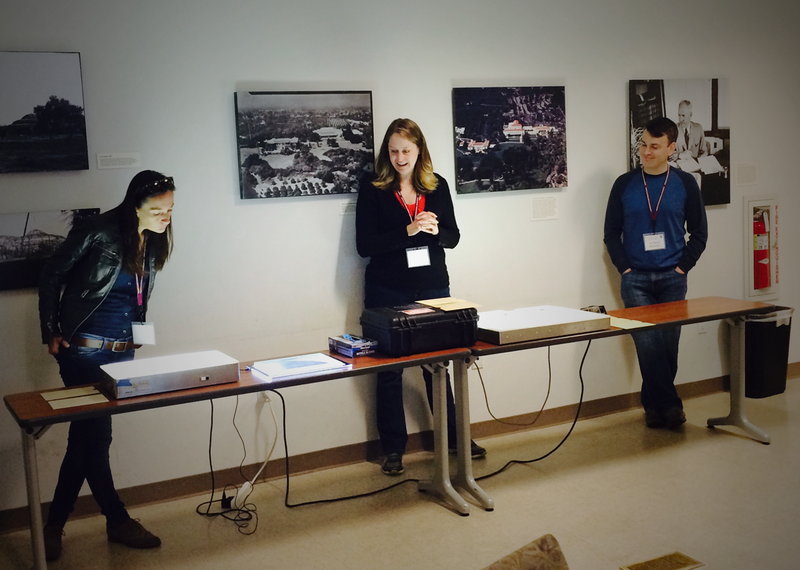 After the plate demo, we were able to bring the discussion around to the difference between the kinds of direct images on the plates we had seen and the spectroscopic plates that Cannon would have been working with. 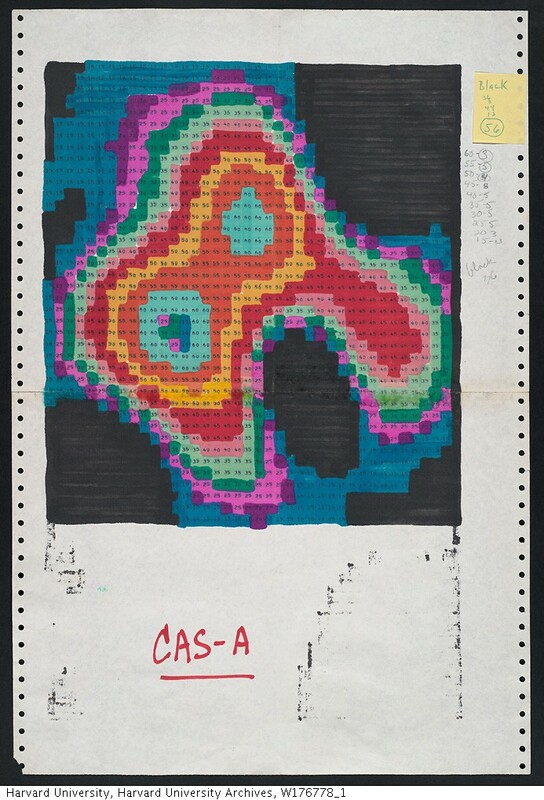 To help with this, we used an image of one of Cannon’s actual spectroscopic plates that Jonathan McDowell, an astronomer working at the Harvard Observatory (where Cannon worked) now, had very helpfully provided for us. Each of the little blurred lines is a star, the starlight having been spread out into a bar by a prism. 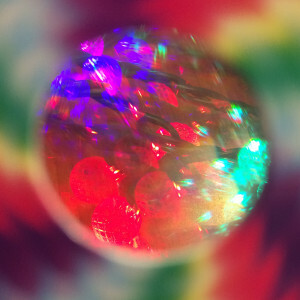 The colors themselves didn’t make it into the photograph, but many of these spectra show clear absorption lines – gaps in the rainbow where no light is seen. Using the placement and intensity of these lines, Cannon grouped them into different star types. 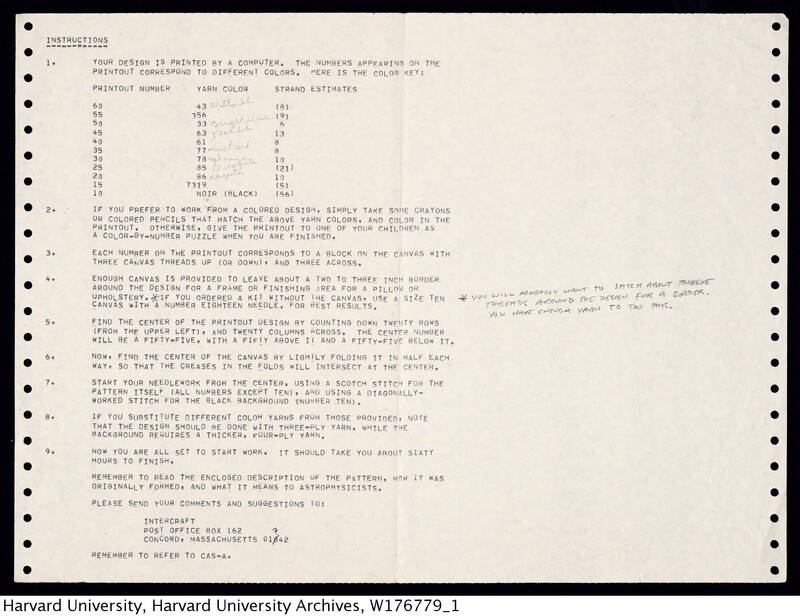 Looking at all of the star spectra and the careful notations, you can really get a sense of the kind of work that went into Cannon’s stellar classification system, and you can see more of the Harvard plate archives here. 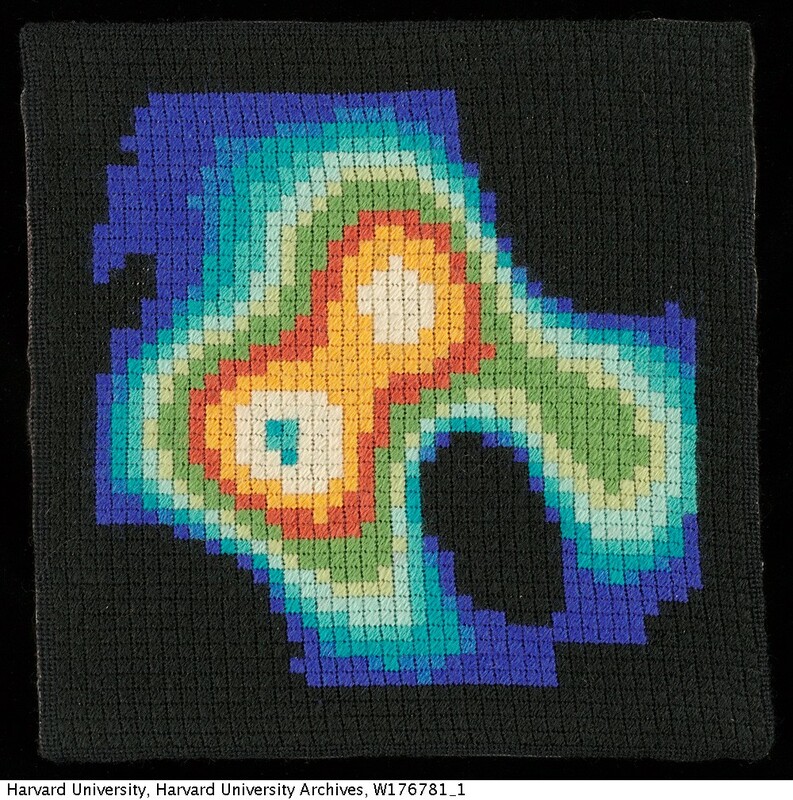 This image became a jumping-off point to talk about the kinds of scientific information that photographs can provide – and then it was time for lunch! Back out on the lawn, we talked a bit about how Cannon has been described at various times, from her own lifetime to today. 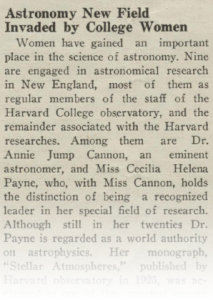 A brief article from 1929 describes her as an “eminent astronomer,” even while the title of the piece suggests an “invasion” of women into the field of astronomy. 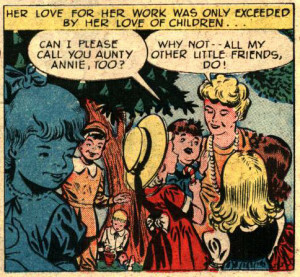 A “Wonder Women of History” comic from 1949 (part of the original Wonder Woman series) portrays her as a determined and accomplished pioneer, but adds that she loved spending time with children as well. A modern depiction from RejectedPrincesses.com shows Pickering helpfully steadying the ladder while Cannon climbs up beside a telescope, holding a wrench. 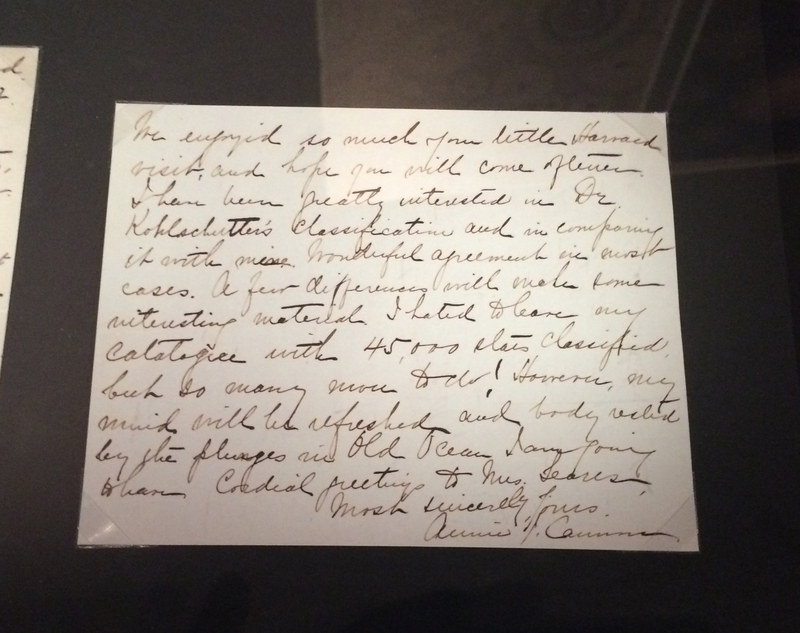 All of these examples bear on how we talk about women in the history of science and women in STEM today. After heading back to the classroom, we passed out diffraction gratings (which work a lot like prisms) called Rainbow Peepholes2 and used them to look at a variety of light sources: the fluorescent lights overhead, a flashlight, white incandescent and colored LED holiday lights. Immediately engaged by the “hidden rainbows” revealed to them, the students really got into exploring the differences between the different light sources. They noticed that white light is spread out into the entire spectrum, but the red and green LEDs were just…red and green. Interestingly, the light from the purple LEDs was separated into just two colors (blue and magenta). 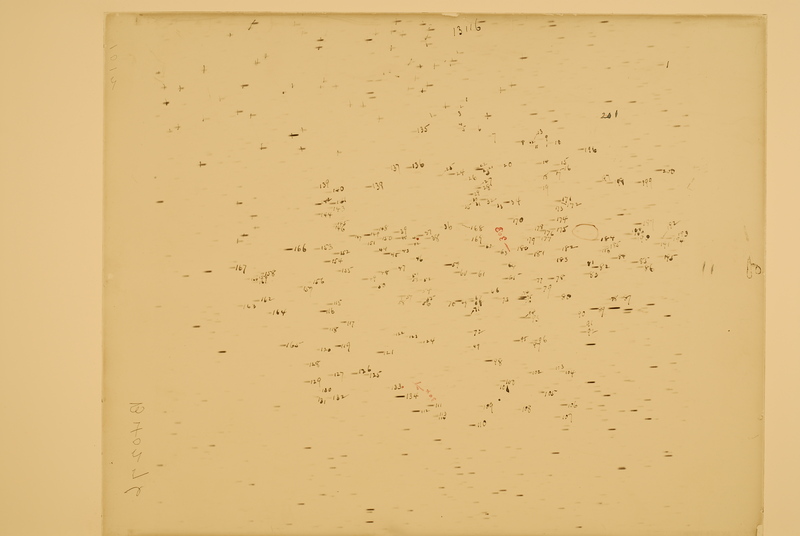 This activity connected directly back to the spectroscopic plates that Cannon worked with, and we followed up by attempting to classify the spectra ourselves into at least two identifiable groups. We didn’t quite have time for the last activity – making stellar trading cards – but we sent everyone home with the materials to make their own. 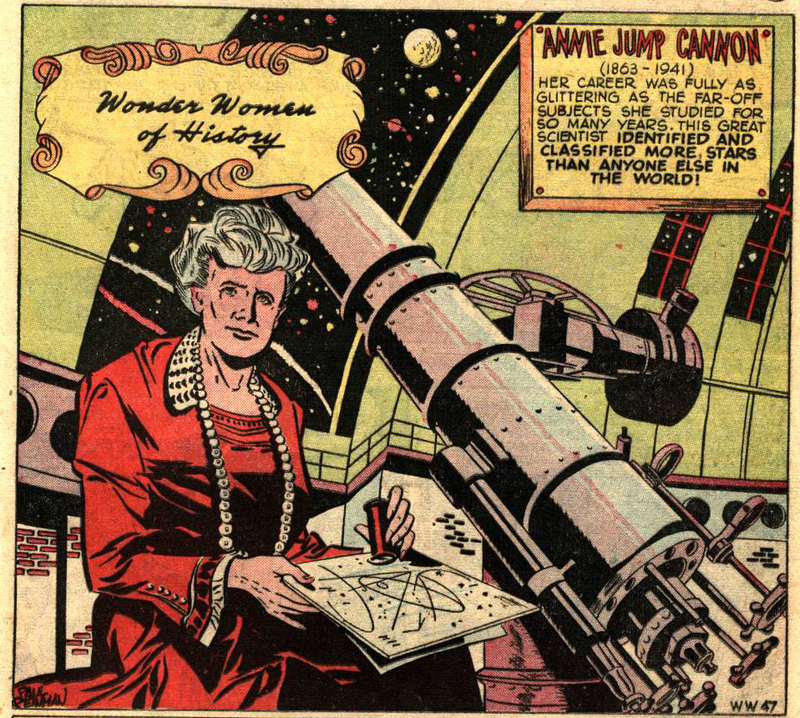 Here’s the trading card template I put together and a bunch of Cannon quotes about her work and the field of astronomy as she saw it. Feel free to use it, or adapt your own! I imagined using it to make a card for each star type, but you could also do it with individual stars, and I could see it working for other kinds of objects – moons, exoplanets, asteroids – too! We wrapped up the day with a discussion about spectroscopy in astronomy and remote sensing today, and we talked a bit about how the spectral classes fit into our understanding of how stars evolve and what’s going on inside them. And that was it! Quite a long day, but very rewarding, and I’m happy to share all of our work putting this workshop together. If anyone else has resources to add, or would like more information on what we did, please let me know! I made this (hastily) for MESSENGER’s final pass around Mercury and impact just now. 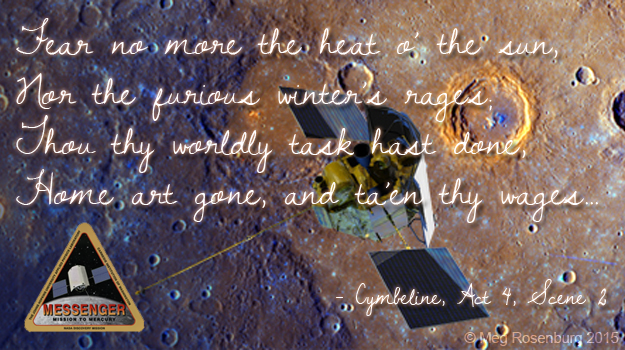 Few spacecraft have dealt with heat o’ the sun and winter’s rages like this one! It has really been an impressive mission. The Cymbeline quote is all the more appropriate given that MESSENGER’s final resting place is near Shakespeare basin. 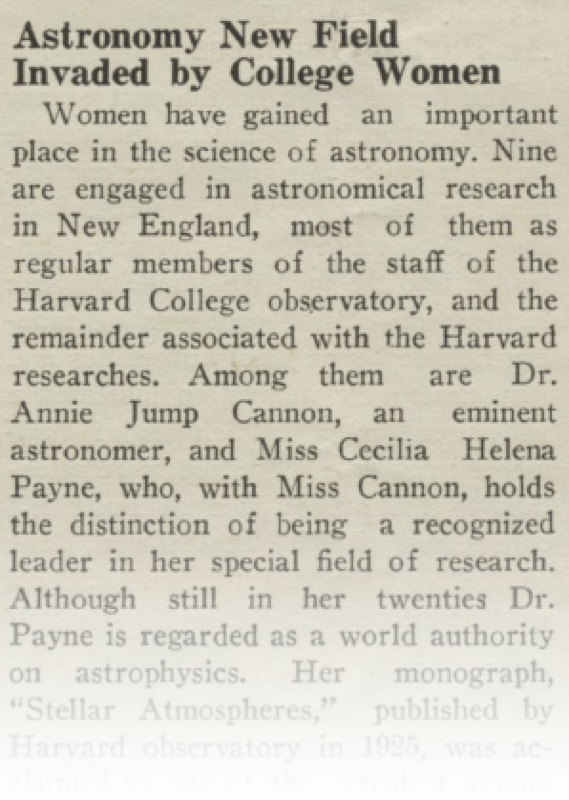 I recently came across a brief article entitled “So You Want to Do Research” in the December 1943 issue of Pro Tem, a Radcliffe College campus publication. 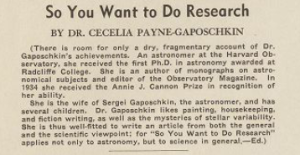 Written by Dr. Cecilia Payne-Gaposchkin, the column offers some advice to students considering a career in research and describes some of the astronomer’s views on the process of science. Payne-Gaposchkin describes an environment that is both demanding and rewarding, and she doesn’t sugarcoat the tougher bits. Some of her advice sounds so applicable to graduate students today that it’s almost jarring to come across a sentiment or stylistic element that belongs to an earlier time, as when she consistently uses male pronouns to describe “a scholar” in the abstract. I’ve pulled out a few excerpts that spoke to me here, but the whole article is available in Harvard’s digitized collections. Only become an astronomer if nothing else will satisfy you; for nothing else is (approximately) what you will receive. The material returns will never be great, and most of the scholars who receive them do so at the price of sacrificing time that they might devote to pure scholarship. Fame is the reward of the few, and those who achieve it realize too often that it has been purchased by efforts that were not their highest. If you do your job, you will be able to earn your living, and you will taste the delights of discovery, than which (to the addict) there is nothing more satisfying. That is all. If it is enough, then become a scientist. If it is not, get out before it is too late. Probably the most important starting points are good health, good eyesight, humility, and a sense of humor. There are some for whom the world seems to hold no mysteries; for them, everything fits into a preconceived scheme and the whole is convincingly explained. They will never be scholars. …a complex training, difficult to describe, yet more difficult to achieve. 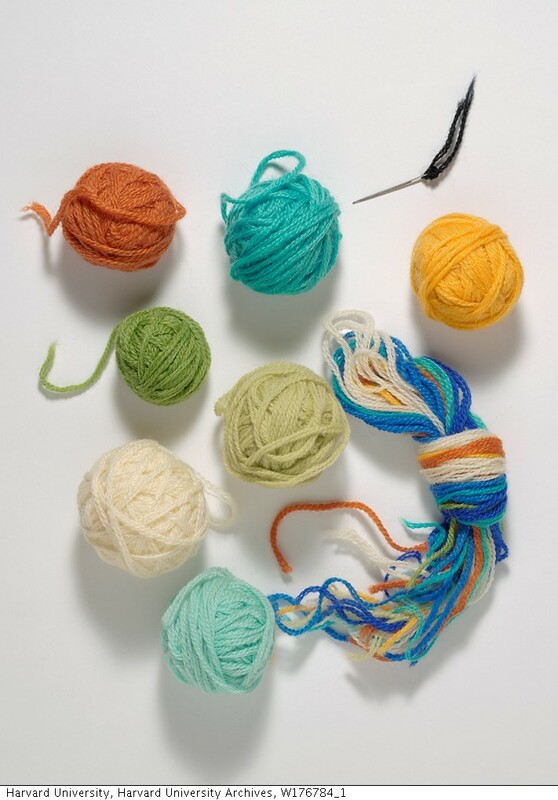 It involves a continuous habit of sorting the uncoordinated facts, fitting them together again and again until some pattern emerges, seeking other facts that seem to piece out the pattern. The process is one of working ceaselessly on an intellectual jigsaw puzzle, in which you have little clue to the subject, the scale of the design, the relationships of the pieces. The very elusiveness of the pattern is its chief fascination, the possibility that the final picture may prove to be of something never before seen by mortal eyes. Astronomy is peculiar in several respects; it is a science debarred from experiment, and it deals chiefly with processes that are so slow that they defy any but long-drawn and precise observations. It is a schooling in precision and patience, and it compels the construction of long-term plans and the formulation of long-term problems. Lastly, there should be a word about technique. Not the detailed technique of the branch of knowledge, the particular vocabulary, symbolism, and equipment. Rather the technique of the intellectual jig-saw puzzle. Let no one expect it to be easy work. It is hard labor, often carried to the point of exhaustion and despair. Repetitions carried to the point of utter boredom. Simple, elementary processes that would shock the uninitiated by their naïveté. As a science communicator, I spend a lot of time trying to convince people that you don’t have to be “so very clever” to understand or to do what scientists do on a day-to-day basis. It’s very much within “the power of an ordinary mortal,” because, well, scientists are ordinary mortals. From a historian’s perspective, it’s interesting to hear Payne-Gaposchkin’s thoughts on academic fame. It’s both conferred rather arbitrarily, and it takes up time that could be devoted to pure research. By 1943, she had already received numerous awards for her work,1 so it’s interesting to hear a somewhat cautionary note in her address to students.2 And as a former (recovering?) 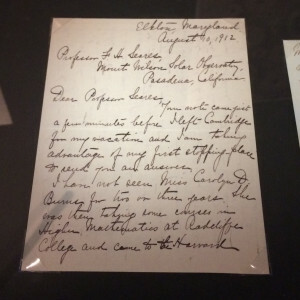 graduate student, I appreciate her no-punches-pulled description of the “exhaustion and despair” and “utter boredom” of research just as much as her admission that she’s an addict of the “delights of discovery.” So you want to do research? Couldn’t hurt to read this first. Astronomers are not often thinking of pure discovery. We have no expectations of ever finding at one glance, as did Tycho Brahe, a new star rivaling Venus in brilliancy, nor any hope of emulating Galileo’s thrilling experiences. Something different must satisfy us in these later days. 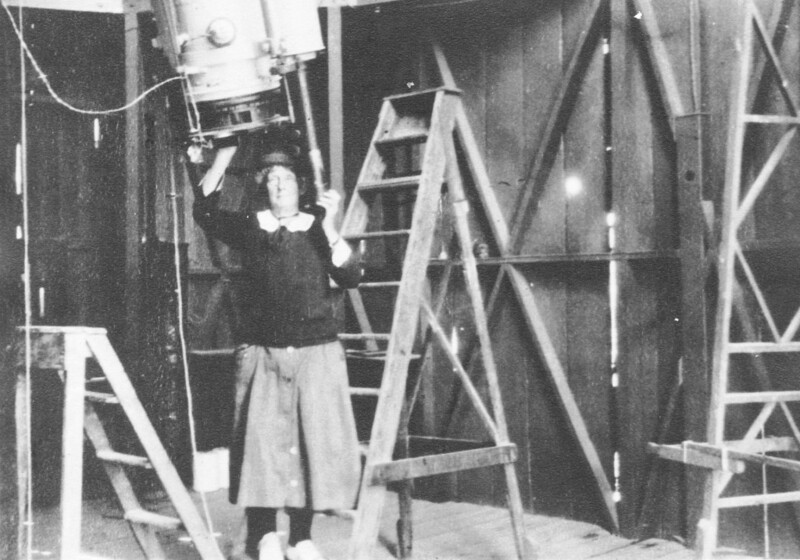 Has it not been something of an adventure to take any part, however small, in the remarkable development of astronomy during the present century? It is often difficult when one stands at the cross-roads to choose the new and untrodden path. It is not the path of our dreams. 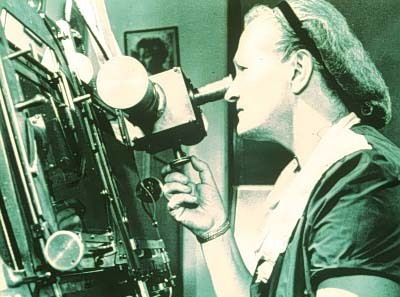 Who in the “gay nineties” ever dreamed of an astronomer who was not nightly gazing through a large telescope at soul-thrilling celestial objects? Time has proved, however, that along the new and seemingly unromantic photographic path lay all the coming adventures. There is romance in science! What more appealing to the imagination than the fact that these dark lines in star light bring us messages as to what the stars are, how they are traveling, and how far away they are. 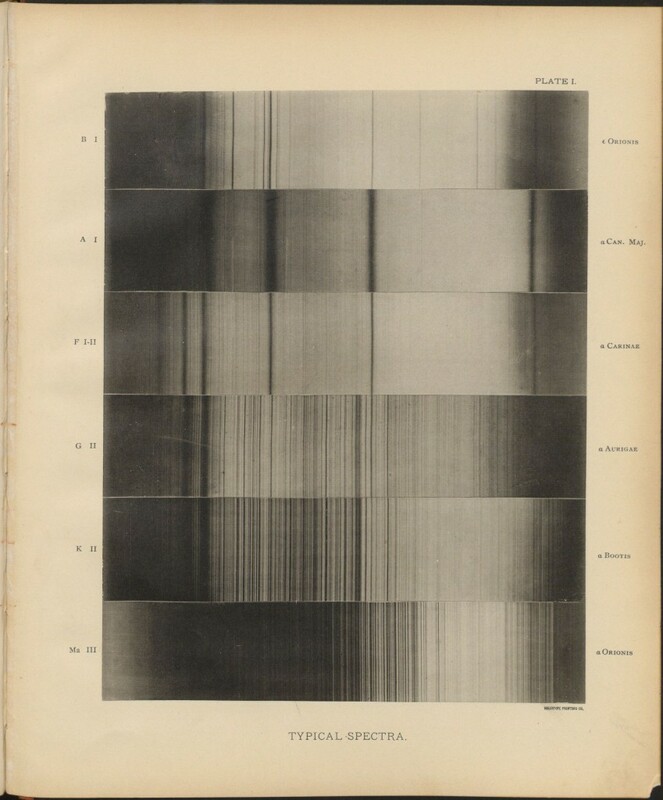 The spectrum of such a star, if it can only be obtained, always tells the story of its vagaries in the bright bands indicating glowing gases. Not soon to be forgotten was the thrill of finding such an object while in Arequipa, of eagerly photographing its spectrum and beholding on the negative the tell-tale bands proclaiming its escapade. To the gleaming southern stars, thus one was added, whose light had been traveling fifty thousand years to shine down on us over the Andes. When the California astronomers came east to the eclipse of January 24, 1925, we could boast of no such optimistic weather reports, but almost contrary to our own expectations, we had a clear sky on that below zero morning. No clouds marred the spectacle from Cornell to Nantucket. The mystical shadow bands danced, glowing prominencies streamed out, and the glowing corona flashed forth its matchless beauty. 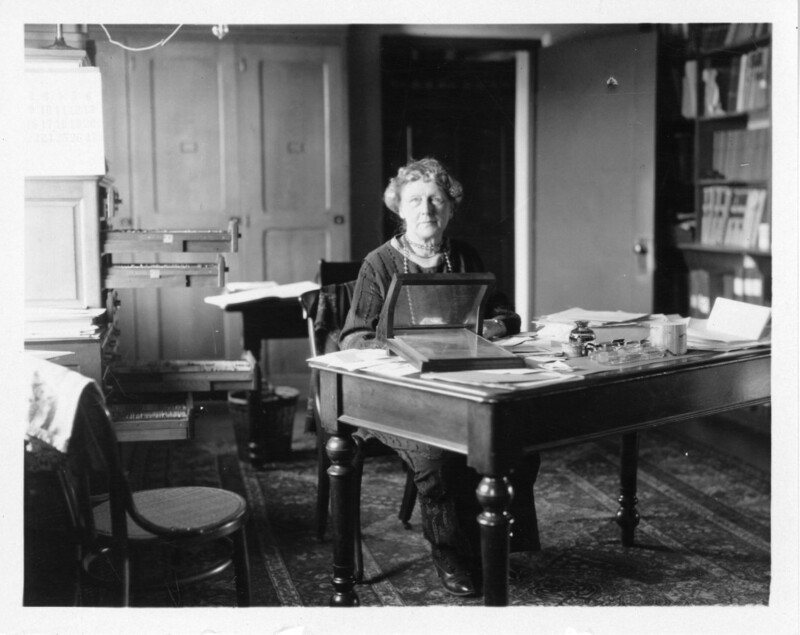 Curious, I looked around for other personal accounts from the women at Harvard College Observatory, the “computers” that were the backbone of Edward C. Pickering’s research program in the decades surrounding the turn of the 20th century. While not at all a comprehensive survey of the online archive’s content, my little search yielded a couple of items that I am truly happy to have come upon. I’ll do my best to share some of them here as well. As part of my ongoing collaboration with NASA’s Orbiting Carbon Observatory 2 mission, I’ve put together this 4-minute history of climate change science. Global warming may seem like a recent issue, but people have been investigating it for a long time. Only by choosing to engage with the natural world and gathering information can we prepare for whatever the future may bring.